Have you ever wondered where your property tax dollars are being spent? How are your property taxes calculated? When are payments due? Property taxes provide the main source of financing for local government units. Property taxes support a number of services such as police and fire, new construction, building maintenance, welfare, local infrastructure (highways, streets, roads), libraries, and much more. 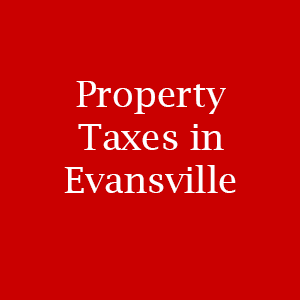 Your property taxes help keep the Evansville area running smoothly. Your property taxes fund a portion of your local government’s budget for the year. As you can see from the percentage breakdown, that includes many important services such as public education and city services. There are two separate installment due dates for property taxes in the state of Indiana. The first is May 10th and the second is November 10th. The county treasurer mails each taxpayer the TS-1 at least 15 days prior to the property tax due dates. This statement includes the taxpayer’s property tax bill in addition to a comparison statement. The comparison statement includes basic information about the property’s assessed value, gross property tax rate, deductions, and other details the taxpayer needs to know. Many homeowners escrow their property taxes. Rather than writing a check, they authorize the bank to keep the property tax money and pay at the correct time. If you own your home or you do not escrow, then it is your responsibility to mail the checks before the appropriate due dates. The state of Indiana imposes a personal property tax on tangible personal property used for business. It is the taxpayer’s responsibility to file an annual Tangible Personal Property Return as Indiana is a self-assessment system. The filing deadline for Indiana personal property returns is May 16, 2016. If you have questions or need assistance in completion of your personal property return please contact us. What should you do if there is an error on your property assessment? The State of Indiana offers a way to request a correction. Like many financial matters, requesting a correction can be complex at times. It may be wise to work with a qualified tax accountant when considering an appeal. Questions about your property taxes? Contact the tax professionals at Baker Retirement & Wealth Management, PC. Our team has been providing tax advice and other financial services in the greater Evansville area for nearly thirty years. We help individuals as well as businesses with taxes, wealth management, and other financial matters. Feel free to stop by our offices in Evansville, Newburgh, Boonville, or Owensville. You can also give us a call toll free at 1-866-244-3517.